We are still in the vineyard every day so meals either have to be fast or planned ahead. 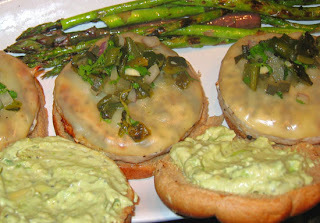 Last night we made turkey burgers with pablano relish (Bobby Flay) and a guacamole cream (Greek yogurt, avocado, lime juice, garlic, cumin, salt and pepper) along with our second picking of asparagus EVER! We planted them several years ago and didn't pick a one last year, and this year we can only pick for a few weeks. We planted 2 varieties but only one of the purple ones have come up. We grilled them with a little garlic and olive oil. Great! Of course, we didn't come inside until dark, so dinner was at 9:00. We also had Mexican inspired last night. It was planned ahead. 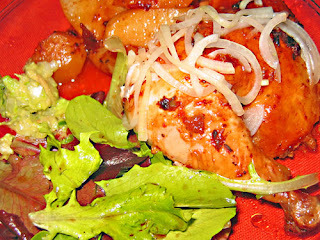 It was red chili roasted chicken with potatoes, served with guacamole, marinated onions and a salad; from one of Rick Bayless's cookbooks. The chicken was okay; I think if I were to do it over again I would either cook it or marinade it a lot longer. The guacamole was, as always, wonderful. Just avocado, minced onion, serrano chili, chopped cherry tomato, cilantro, lime juice and salt. The onions were a great addition, I might add; just very thinly sliced tomatoes with a tablespoon or two of cider vinegar at least an hour before you eat. A simple but tasty condiment. Why this obsession with south of the border? Well, two things. I stopped by A Southern Season and picked up there calendar. OMG! Diane Kennedy is coming!! I am signed up and so excited. Also Patrica Wells and Jo Anne Weir! World Class Chef's and Instructors! Wow. Then I was coming back in from the vineyard and walking through the remains of last years garden (read weeds) and no hopes of preparing it for a spring garden for at least another week, I discovered many random patches of cilantro in areas that will need tilling. This is the favorite herb of the founder and and host of weekend herb blogging, Kalyn, of Kalyn's Kitchen; Be sure to go there for the recap on Sunday. I grabbed a handful of it each evening on the way in and featured it in the pablano relish and in the guacamole, making it my herb of the week. Combine all ingredients. Let sit at room temperature at least 30 minutes before serving. That's it for today. Check out the website for more recipes. Volunteer cilantro in the garden! I hope you realize how lucky you are. My garden is still pretty much weeds too, but if it warms up a tiny bit I'm going to go out and trim some of the herbs where little buds are sprouting. All the food you're describing here sounds wonderful. If I ever get to visit anywhere near there you must cook something for me! How lucky to get asparagus! 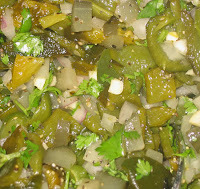 Your relish is a must try. 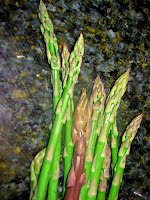 I´m waiting for asparagus to come to the market. Till now we have only greek or spanish here. There's something fishy going on..